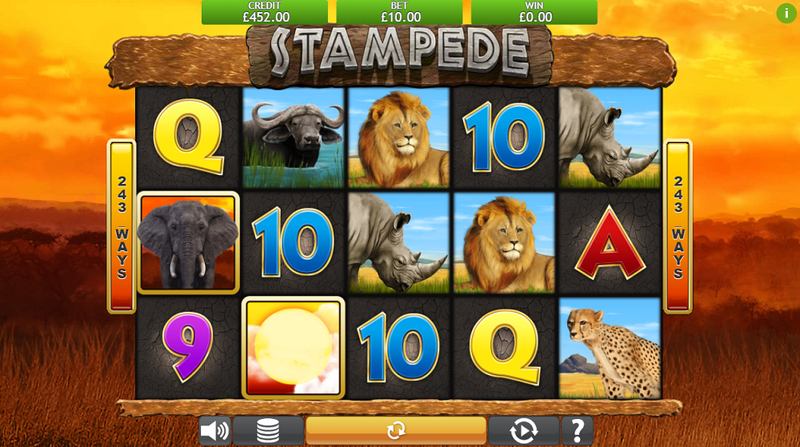 With a fantastic chance to rake in some big wins, Stampede is one slot which is not going to trample you flat. Brought to us by the amazing developers at Eyecon, you can join in on the action right now at Slot Games! Eyecon has included a number of different symbols in this game which all tie into the over-arching safari theme they have chosen. The lower-paying symbols are a run that both slot lovers and newcomers will have seen in many a different place before; 9, 10, J, Q, K, and A. The higher paying symbols are all animals you could see on safari; a cautious water buffalo, an enigmatic leopard, a proud rhino, and of course a majestic lion. The game’s scatter is a fifth of these incredible animals; the noble elephant. Not only do you get a bonus when landing a win with the elephant, you will also trigger the game’s free spins. The Wild of the game is a gorgeous sun handing in a red sky. From the wooden reels to the quiet savannah in the background, Eyecon have ensured that this is a beautiful game to play at every turn. If you are looking for a beautiful game to play, you will certainly have one here. Stampede is a great game to play if you are a newcomer searching for the ideal first slot because it is a very simple slot to learn. There are no crazy bonus features and all of the controls can be found right underneath the reels. Your bet is adjusted by clicking the stack of coins button. This will bring up a pop-up screen which will allow you to cycle through the various bets available. With a range of 25p to £50, there is going to be a bet for everyone’s budget. When you are ready, you just have to hit the spin or select from one of the game’s many autospin functions. Stampede awards wins for every matching symbol in adjacent reels running from left to right; making it super easy for you to pick up a great win. There may not be crazy Wilds and gamble features everywhere in Stampede, but there are free spins and that’s all we need. To get some free spins, you just need 3 or more of the elephant scatters. You will then be offered some different spin options. Stampede combines free spins with win multipliers so the fewer spins you have, the higher the win multiplier you will have. The levels in the game are quite simple; 20 free spins have a multiplier of 2x, 15 free spins have 3x, 10 free spins have 4x, 8 free spins have 5x, and 5 free spins have an amazing 10x. This, of course, means that the lower chance you have of winning gives you a higher win if you do manage to grab one. It is a fantastic feature that is bound to bring some amazing wins to you with a little luck! Stampede is a great game with plenty going for it. If you are a fan of simpler slots with a few brilliant features to help you secure a win, you should definitely give it a play today!